Accompanying, “A Building of Destiny”, is a short film about the role of Confederation Centre of the Arts as Canada’s national living memorial to the Fathers of Confederation. 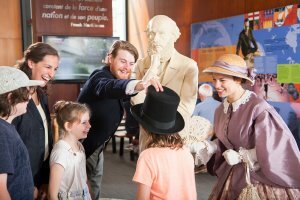 The replica also boasts historic vignettes from the Confederation Players and a guided interpretation of the exhibit, which includes original artifacts from the Confederation Chamber during peak season. Please contact Joy Gallant at 902.628.6118 or email chamber@confederationcentre.com if arriving with a group of 20 or more.